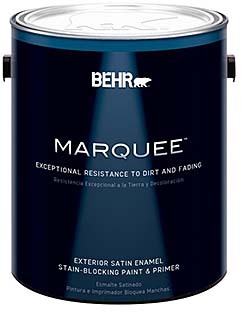 The Marquee exterior paint and primer line offers longer-lasting color, ultraviolet protection, and the ability to resist rain as early as 60 minutes after application. Specialized polymers in the 100 percent acrylic formula form a non-stick surface to prevent dirt adhesion and maintain the appearance of exterior surfaces under challenging weather conditions. The line is available in 64 different colors.